The 1986 American Gold Eagle Coins marked the first strikes minted under the Gold Bullion Act of 1985 (Public Law 99-185). Congress created the Act to offer investment-grade gold coins to the public. The Act also made several stipulations that pertained to the coins. One was that the gold used in them must be mined from sources within the United States. Another required that the obverse (heads side) design of the one ounce coin contain an image of Liberty while the reverse (tails side) contained a design representing a family of eagles. Available for only part of the year, intense interest in both the bullion and proof versions of the coin led to a mintage level for the strikes that would not be obtained for either variety for years to come. 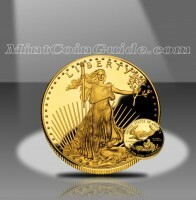 The US Mint struck a total of four different sizes of the Gold Eagles – one ounce, 1/2 ounce, 1/4 ounce and 1/10 ounce. Despite being available for only a few months, collector interest in the strikes was very strong resulting in a large amount of the coins being sold. The United States Mint struck a total of 446,290 of the One Ounce Proof Gold Eagle’s in 1986. No fractional proofs were created that year. The 1986 Gold Eagles served as the debut strikes for the Gold Eagle Program. The US Mint released the Gold Eagles in the last few months of 1986. The One Ounce Proof Gold Eagles were sold by the US Mint directly to the public for $550 a piece. Bullion Gold Eagles were sold by the Mint’s network of authorized purchasers for a small premium above the spot price of the gold contained within them. For the year, gold averaged $367.53 an ounce. Gold Eagles were struck at the both the US Mint’s facility in West Point and its facility in Philadelphia. However, only the 1986 One Ounce Proof Gold Eagle shows a ‘W’ mintmark indicating it was struck at the West Point facility. The obverse (heads side) of the Gold Eagles contains Augustus Saint-Gaudens’ Lady Liberty which was first featured on the Double Eagle coin from 1907-1933. The design is considered by many to be one of the most beautiful ever produced on a United States coin. The reverse (tails side) shows Miley Busiek’s design of a male eagle flying above the nest of its family.